I made an error, a slip-up, a blunder. I miscalculated; I messed up. I used the impending arrival of guests as a handy excuse to replace the tattered and mildewed shower curtain liner in the bathroom that guests use. As I stood in the shower curtain aisle of the Bullseye store, I debated. Cream, white, or clear? Clear, white, or cream? I decided on clear, reasoning that, in our less-than ideally lit bathroom, a transparent liner would allow more light to illuminate the shower stall. And I was right. It does let in more light, which is lovely. But I hadn't anticipated one major drawback of a transparent shower curtain liner. You see, our shower curtain is beautiful and light. And see-through. I knew this, of course. Of course I knew our shower curtain was see-through. It's just that we had always had a cream shower curtain liner before, so we could see through the curtain, but just to the liner. I would pull the curtain to hide the bathtub, and all of its accompanying...stuff. Now, I have no way to hide the clutter in the bathtub. It's a little distorted by the plastic of the liner, but still clearly visible. And I'm disappointed. It bugs me. Not to worry, though, friends. The basement bathroom has a cream shower curtain liner...and a solid brown shower curtain. All I need to do to fix my goof is switch 'em. Around this time of year, my mother in law likes to make a yummy snack mix with candy corn and party peanuts. The sweet of the candy corn juxtaposed with the salty crunch of the peanuts blend to make a wonderful treat. Inspired by Beaver-ly, I made this delicious autumn snack mix yesterday--doesn't it look yummy? I got the idea from here, but modified the recipe to use ingredients that we already had on hand. It made a lot. So I packaged some in 1/2 c. reusable containers for the boys to snack on in the next couple of days. And now, an update on our pumpkin escape artist, who decided to take up residence in a tree, about 20 feet off the ground. Here's what it looked like on August 22. Here's what it looked like on September 6. As you can see, it's a lot bigger and its weight has caused the vine to sag away from the branch. Here's what it looks like today. Hubby strung it up in a mesh bag to support its weight. It's even larger, and is turning orange. I have a friend who lives, oh, about a mile and a half from us. She lives right near one of the routes I sometimes take to town, and I live right near one of the routes that she sometimes takes to town. I am astonished at how often she and I pass each other in our big ol' kid-mobiles as we're ferrying our offspring about. We see each other so often that I wonder how many times she and I must have passed each other on the road before we knew each other. And it's not like we live in the same neighborhood or anything--it's not like either of us actually live in neighborhoods or anything. We always smile and wave, me a bit goofily, I must admit, when we see each other. And I gotta tell you, it really brightens my day to see her, even though we're just passing like two ships in the night. Seeing my friend reminds me that I'm not alone in this whirlwind of mommy-hood, that she and I, and countless others like us, are in the same boat (or kid-mobile), so to speak, caught up in the million details that make up our lives as moms of growing, active kids. It's a good reminder for me, who often feels alone, isolated, and lonely in my mommy-ness. In the busy-ness of our lives, we don't always have time to reach out to each other, to spend time together, but when we pass, I am reminded that someone knows this treadmill I'm on, the challenges, the victories, the defeats. Someone is thinking of me, and least for that moment, and sharing the journey with me. Lately, my oldest son, AKD, has been asking me a lot of questions to which I can answer yes. Mom, can I have a healthy snack? Mom, I need more books to read, can we go to the library? YES! One should always say yes when her child asks to go to the library, doncha think? Mom, I need some more jeans, can we go shopping...in the basement? Mom, I'm cold. Will you snuggle with me? I love answering yes, don't you? I find myself answering no far too often, though. Lately no has become my knee-jerk, pat answer whenever anyone asks something of me. And then I have to back up and reconsider whether I really wanted to answer no in that instance. Sometimes I have to say no because I'm the parent, and I need to look out for my kids' best interest. For instance, my babies do not do well (that's putting it mildly) if they don't get enough sleep. So I need to say no to staying up late, no to sleeping with a sibling, no to a sleepover in the living room on a school night. Those aren't the nos that bother me. It bothers me that my kids keep asking 20 gazillion times hoping that the answer will change, but I'm really OK with saying no to something that isn't good for my kiddos. Sometimes I have to say no because I'm doing something else. Sometimes I have to say no to one kid because I already said yes to another, but too many times a day I have to say no because I'm washing the dishes or making supper or doing any number of things that are sooo much less important than showing my children that they are loved. I mean, those things have to get done, but do they really need to get done right now? But if not now, when? There are only so many hours in a day, and I need to sleep sometime. Sometimes, I'm a little ashamed to admit, I say no, because saying yes would be inconvenient. How do you balance the nos and yeses in life? How can I show my children through my actions, my choices, that they are my priority, but at the same time show them that they are not the center of the universe? How can I show my children that, while they are my biggest and most important responsibility, I have other responsibilities as well? I don't know the answers. I mean, it says right up there ^ in my tagline that I'm not Super-Mom. I can't do it all (subtext: I don't need to feel guilty that I can't do it all). All I can say is, I'm working on it, and it's in the working on it--the knowing that even the best mommies need to work on it--that I take solace. For some reason, in the fall my thoughts turn to all things pumpkin. Pumpkin pie, pumpkin soup, pumpkin seeds. I don't even like pumpkin. But I do like these yummy cookies, which through the magic of canned pumpkin puree, can be made and enjoyed year-round. And they're practically health food, what with the pumpkin, and the egg, and the chocolate. Add pumpkin, egg, and vanilla and beat until light and creamy. Drop by rounded tablespoon onto greased cookie sheets and bake in 350*F oven for 15-20 minutes, or until lightly browned. Cool on wire racks; drizzle with glaze*. 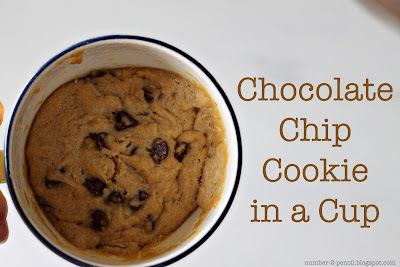 Just FYI, I add chocolate chips to mine, and I never make the glaze. It was Wednesday. I was sitting on the couch, staring disconsolately ahead, but not really seeing the crumbs and dirt and drips and whatever else was currently "decorating" my kitchen and dining room floors. It was Wednesday. Floor mopping day. But as I sat there, barely moving, I knew it wasn't going to happen that day. My motivation, my get-up-and-go, so strong earlier in the week, was gone. I knew this would happen. I just knew it. On the previous Sunday, I swept the floor, gathering an unbelievable amount of debris, the detritus of a few days' living, cooking, and eating in a home with 5 people (at least 2 of whom have an incredibly difficult time keeping their food off the floor). I thought to myself, self, you should mop this floor. It's been...well, I don't know how long it's been, but it's...well, don't take this the wrong way, self, but it's kind of disgusting. You know it's true. You should mop it. Right now. Kids are in bed; Hubby's at a meeting. It's perfect timing. Just do it. I almost talked myself into it, but then I told myself, self, you want to start cleaning on a schedule instead of willy-nilly cleaning things whenever you feel like it. You know that there are some jobs that you find more desirable than others. OK, so not "more desirable"--more like "less distasteful," but you know what I mean. Without a schedule, the less desirable/more distasteful jobs will never get done. If you mop the floor today, there goes your schedule, right out the window, before you've even begun. Is that what you want? Really? So I talked myself out of it again. But I knew, in my heart, that I was not going to feel like mopping on Wednesday. Sure enough, here it was, Wednesday, and the floor was going unmopped yet again. Play some upbeat music. Honestly, who can resist dancing (or at least swaying or moving in some way) when her favorite song comes on the radio? Don't wait for it to happen--make it happen. Crank up your iPod (or put in a CD, if you're living in the dark ages like us), and see what happens. Promise yourself a reward. You know you want that chocolate. Tell yourself you can't have it until the dishes are put away. Or that, after reading one chapter in your textbook, you can read a chapter of that can't-put-it-down book. Force yourself to do a small task. Let me tell you this: motivation begets motivation. I've found that, when I force myself to do something, anything, I feel more motivated to take on other tasks. Do you know what those three actions have in common? All three produce endorphins, and it is all about endorphins. You know how they say laughter is the best medicine? It's because laughing produces (uh-huh, you guessed it) endorphins, which have been shown to decrease pain and increase feelings of well-being. And housework is nothing, if not painful. On that Wednesday, I did not mop the floor, but when I finally mustered up the strength to overcome my inertia, I turned on some music, promised myself some yummy coconut M&Ms, and cleaned the sink. Which led to clearing clutter, which led to sanitizing our kitchen counters and dining table and vacuuming more thoroughly than usual, which led to cleaning the bathroom and straightening our guest room and sorting through Roger's closet to weed out clothes he'd outgrown. My motivation? I got it back. Temporarily, anyway :) It's Wednesday again, you know. We'll see if that floor gets mopped today. Whatever you do, work at it with all your heart, as if working for the Lord, not for human masters, since you know that you will receive an inheritance from the Lord as a reward. It is the Lord Christ you are serving. The other day my sis mentioned something sweet that my youngest nephew had been doing. You see, his older brother, Ua, started kindergarten at the end of August, and BL started 3-school (that's preschool, just in case y'all didn't know) about a week ago. And every day, BL has been asking who has school that day. Do I have school, mommy? Does Ua have school? Isn't that precious? Just to make it a little more complicated, my sis, an adjunct professor at a local college, has school two days a week as well. I suggested my sis make a visual schedule for BL to help him know who has what going on each day. I mentioned that it would help him learn the days of the week, and help him develop a concept of time as well. My suggestion was met with a short pause, and then a slightly sarcastic, "suuurrre...great idea." Which I knew meant, "um, Scarlet, you're a little nutso. No way am I doing that. But I still love you." No matter. Chip is always saying that it's her goal in life to be mentioned on my blog (OK, maybe she's not always saying it, but she has mentioned it once or twice), so I went ahead and made one for her. It's super easy to do. Just make a table in word. Because there are 4 members of the D family, I made 5 columns: one for each family member and one for the days of the week. Then place a picture of each person in the appropriate row. Ua has school and Bbil has work every week day, so I put a picture of each of them in each row, Monday through Friday. BL just has school on Tuesdays and Fridays, so his picture is only in those rows. 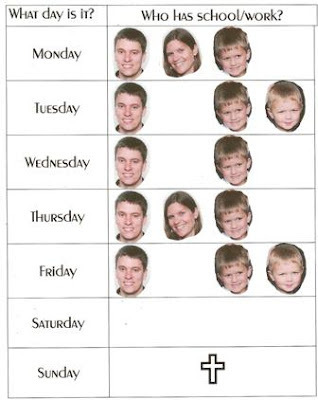 Chip has school on Mondays and Thursdays, so her picture is just in those rows. You certainly could adapt this visual schedule to fit your situation. Maybe you don't have people going to school on different days. Maybe you want to put a picture of the grocery store on Tuesday, the library on Thursday, and ballet shoes on Friday. Whatever it is that your little one wants to keep track of, go for it. Once you have your chart, print it on cardstock and laminate it (or cover with clear contact paper or put it in a plastic sheet protector) and hang it up where your preschool aged child can reach it and will see it every day. Use a clothespin marked "Today", to indicate which day it is. When your kiddo wakes up in the morning, have him move the clothespin to the next day, et voila, everyone will know who has something going on that day. 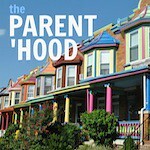 I've linked this post up to The Parent 'Hood over at O My Family Blog. Have I mentioned that I love Pinterest? There is nothing to eat in our house. OK, that's not true, there's just nothing to eat in our house that incorporates chocolate in a satisfying way. The fact that I've been avoiding grocery shopping like the plague this week is possibly a contributing factor in our pantry's current inadequacy. It was 10:39 p.m. and I was rummaging through the cupboards (even though I knew there wasn't anything there) praying for something to satisfy my need for chocolate. I was even considering getting in the car and driving 6 miles to get something, preferably a cookie. Specifically an oreo cookie. Mama loves her some oreo cookies. But I couldn't. I was parenting solo, and I'm pretty sure it's considered irresponsible to leave your three sleeping children alone in the house at night. Even if it is for such lofty purposes as cookie procurement. I remembered seeing these cookies in a cup--a single serve mug of ooey chocolatey goodness--popping up in my feed from time to time. So with just a quick search, I was on my way to my chocolate fix in mere minutes. Thank you, from the bottom of my heart (and my coffee mug), for sharing this recipe, Melissa @ no. 2 pencil. In just a minute or two, my empty mug magically transformed into a vessel containing bliss in the form of a single-serve warm chocolate chip cookie-cake. Mmmm. And ice cream. Oh yes, I went there. 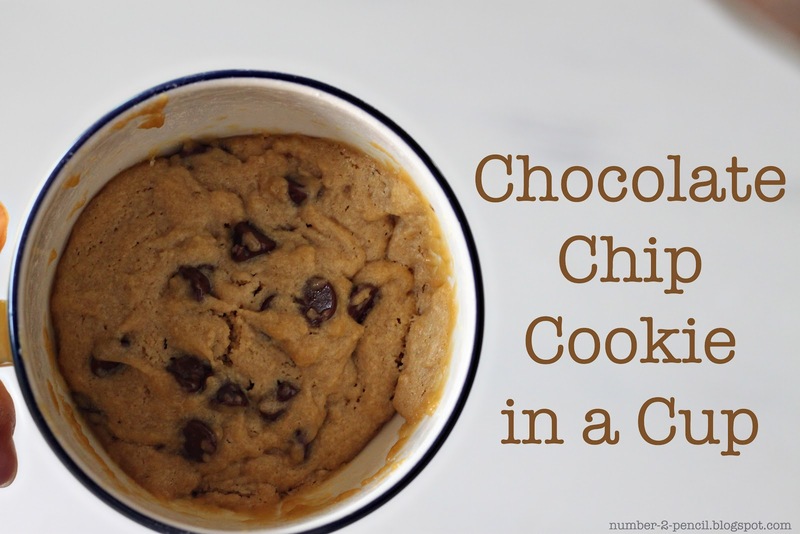 In addition to this chocolate chip cookie in a cup recipe, Melissa's got recipes posted for peanut butter, sugar, nutella, and red velvet cookies, all baked in the microwave, in a cup. Check it out! The seven-year itch is a psychological term that suggests that happiness in a relationship declines after around year seven of a marriage. The urban legend goes that if your marriage can survive seven years, you're set. Not true, of course, but people who know about these things have done studies and they've concluded that it does seem like a lot of divorces happen after about 7 years. I've heard that these days, it's more like a four-year itch, and I would not be a bit surprised to learn that it's even earlier than four, what with our nation's consumerist, me-first, everything's disposable mentality. I don't know about happiness declining after seven years, but I gotta tell you, when you've been married 17 years, like I have, things just start to fall apart. We need a new mattress, new headboard (seriously, how can it not bother Hubby that our headboard covers up about 1/3 each of two windows?! ), just bought new living room furniture because the old stuff was getting a bit worse (read: a lot worse) for wear, our non-stick pans are no longer non-sticky, we've lost or broken several of our knives, and our flatware keeps disappearing. We started, 17 years ago, with 16 place settings of dinnerware. Now, we are down to 12 plates, 10 salad plates, 9 bowls. In two different, non-coordinating patterns. Teacups, though? Still have 16 of those. I know it's not just me, because my sis, who also has been married for 17 years (that was a busy couple of weeks for my parents), has the same problem. It bothers me that we only have enough matching dishes to serve our family plus just one guest, a meal at our home. Now some people don't care about such things. They think, well, as long as we have one plate per person, who cares if they match? Boys! But me? I have always longed for matching dishes. *Sigh* Pretty much whenever we have guests, we serve 11 people, and it's getting a little old not having enough for everyone. Like the time I served soup. Nine bowls. We had to eat in shifts. And I'm not even kidding about that. Look at my shiny new dishes. These are not the ones I fell in love with, not by a long shot, but at least now we can set a matching, possibly even beautiful, table for meals with extended family. And other guests, if we ever have any. Plus, I won't be nearly as upset when these break as I would be if I bought the ones I love. Now, however, I find myself in a rather Laura Numeroffian situation. Now I "need" new kitchen towels, new serving pieces and utensils, and wouldn't it look nice to have some new placemats and napkins (never mind the fact that trying to keep those things in place and looking pretty with those 4 boys running around, always wanting to eat and stuff, drives me insane). Isn't it interesting how, when you have one new thing, one nice thing, it makes everything else that you have, that was just fine two seconds ago, seem shabby and not good enough? Oh, yes, and if we really want to have matching place settings we'll have to get new flatware as well. I'm pretty sure I "need" some new baking dishes, from someone like Rachel Ray or Paula Deen, because the casseroles have to look pretty on the table, too. Oh, and some lovely mosaic napkin rings would be just the thing to "make" the place settings. My friends, I have missed you. I don't know how many blog posts I've started in the past week or so--started, and then discarded as so much drivel. I don't even want to hear about my life, so why would you want to? But I so want to blog, to check in with y'all. I just don't feel like I have anything *something* (important? profound? humorous? witty? worthwhile?) enough to say. I'm just not feeling it. So how about an update? A completely mundane and boring and ordinary update. Do you ever have times like this? When you're just not feeling it? Blah. A loyal reader sent me this pic of the gift she and her kiddos put together for their teachers. Love it! She said she was inspired by this post. Our 7th grader, AKD, ready for the bus, at way-too-early-o'clock. Roger and MC ready for preschool and 4th grade, at a much more reasonable hour. Have you been wondering about our little pumpkin escape artist? Well, here it is. Not so little anymore, is it? To make your own school bus (I got the idea from The Happy Home Fairy), spread yellow frosting on a whole graham cracker. Split an Oreo or other chocolate sandwich cookie in half and attach for wheels. Use square cereal (I used cinnamon toast crunch, but you could use Chex or Quaker oatmeal squares) to make windows. So, I lined up the boys to take their picture. And the big bucket was right above their heads. Wow, seriously, can you believe it's time to head back to school? This summer flew by, just like I knew it would. So, do you remember our list? You know, the list of things we wanted to make sure we did this summer? We finished. Well, mostly. ~ The new pool--the one with a zipline and a climbing wall you can jump off of into the water. This was so much fun! I was so proud of MC for jumping off the cliff and enjoyed sliding down the family slide over and over and over (and over) again with Roger. This outing was fun and educational--our guide did a great job. We touched fossils that were millions of years old, saw some cool rocks, and even got to see a few bats who have found their hibernation spots already (along with one that was still looking). We will definitely be visiting again. ~ Take a picnic lunch and bike along the river in the city, play in the fountain, and watch the barges. We did this just last weekend, and what a gorgeous day we had. So proud of Roger for biking almost 5 miles along the river. Have you been to one of these places? You really must--there are wall to wall trampolines, as far as the eye can see. In fact, there are even trampolines on the walls. Totally gives new meaning to the phrase "bouncing off the walls." So much fun, and such great exercise! We will definitely be going back. I'm sensing a theme here. That MC, he loves to bounce! What a beautiful day this turned out to be. And what a lovely way to cool off! We actually went on a couple of train rides this summer, but this one was Roger's first. He was thrilled! So, this is the only one we didn't get to. We did go to a couple of beaches this summer, but not this particular one. We went to this one, too, in June, just before school let out, but I don't think that counts. I think Roger and I will go on Tuesday after his first day of school. As of right now, it looks like the weather will be perfect for the beach. It still amazes me how much we did this summer--it was jam packed with fun adventures--we made some terrific memories. And the list, with just three things per person? Perfect. Each of us did three things we really wanted to do, along with a lot of other fun things.